Possibly the trickiest part of putting together a Facebook ad campaign is choosing the right audience. 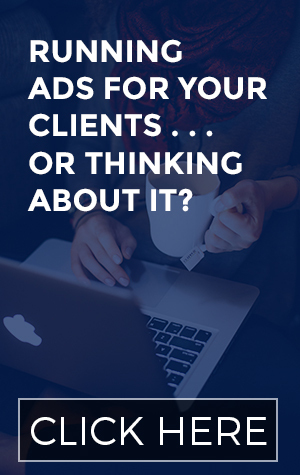 You have SO many options, and most people will tell you that the success of your ads depends squarely on who your ads get shown to. 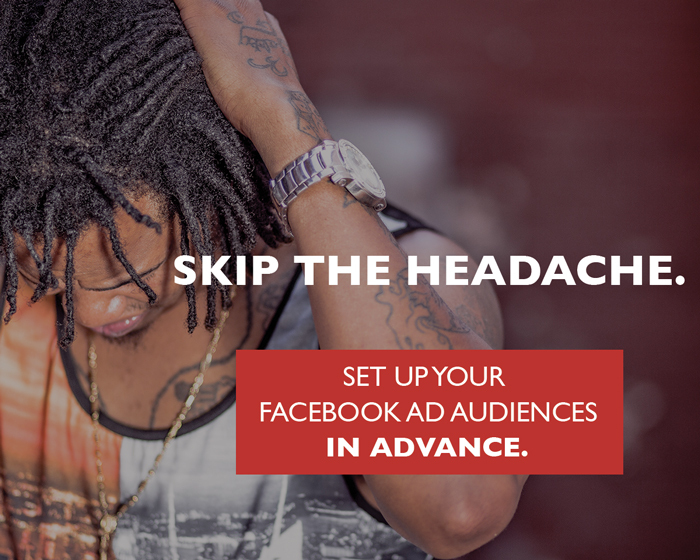 If you’re struggling to figure out who to target, check out the Audience section over on this Facebook ads resource page. One of my favorite techniques is to actually build my audiences before I do anything else. It’s the ultimate time-saver, and not for reasons you’d necessarily think of. I’ve seen it happen more times than I’d like to count: Martha the Business Owner creates a piece of opt-in content that’s for a very specific group of people. For example, the listeners of a particular podcast. Martha’s excited because she thinks she’ll be able to get it right in front of those podcast listeners using Facebook ads. They’re going to click on her ads like crazy and her list is going to grow like wildfire. WOOHOO! So she writes her ad copy and creates images for the campaign, all of which take up a good chunk of time. She starts the process of creating the campaign in the Power Editor, and before long she gets to the part where she has to put together her audience. But Martha is confused: she doesn’t see how she can target that podcast’s listeners. She hires an expert to help her figure it out, only to learn that sometimes you can’t get as specific as you’d like when creating your audience. So she does her best with an audience that might have some of those podcast listeners in it, but her click-through rates are low and sign-ups are few. 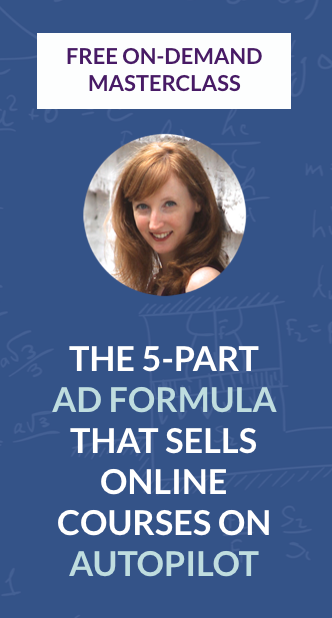 She tries all kinds of different audiences only to learn that this particular opt-in content just might not be the right fit for Facebook ads. Money lost. Time lost. Frustrations abound! This is what I mean about saving time when you create and save Facebook audiences ahead of time: it ensures that there are no surprises when you’re in the middle of putting together your campaign. Now I want to clarify something: I don’t believe that you should only create opt-in content that’s a perfect fit for a Facebook ad audience. There are lots of other ways to build your list, and having an opt-in that attracts that perfect prospect means you’ll build a healthier list in the long run. But if Facebook ads is your go-to strategy for list building, you damn well better make sure you’re able to target the right people first. You’ll be surprised by how easy it is to explore your audience options without bothering with the entire process of creating a full campaign. From the Ads Manager, click on the hamburger menu at the top left and then hover over All Tools. Click on Audiences, which you’ll find under Assets. Click the blue Create Audience button, and select Saved Audience from the dropdown menu. Now you’re looking at the exact same interface you’d use to choose your audience if you were putting together a campaign. The only difference is the Audience Name field at the top. Skip the name part for now. Put together your audience with demographics (age, location, gender), interests and connections if necessary. Then you should name this audience something that’ll make sense to you in the future; I like to use my interests and demographics in my names, like Women US Porterfield 25-44. That translates to women in the U.S. between 25 and 44 who are “interested” in Amy Porterfield. Then hit Create Audience at the bottom, and you’re set! Whether you’re using the Power Editor or the Ads Manager to create your ads, the targeting part is pretty much the same. Instead of leaving it set to Create New, click on Use a Saved Audience and choose your audience from the dropdown! 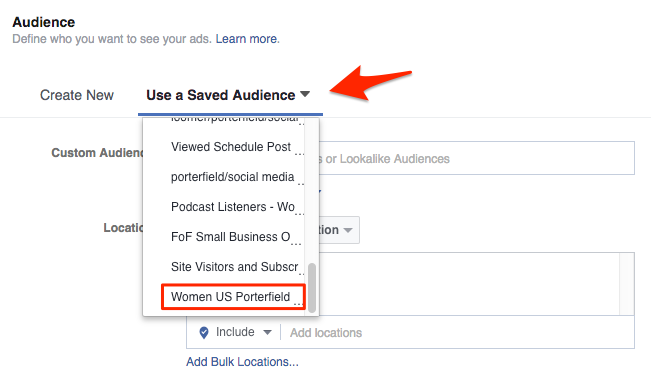 Your saved audience will populate all the targeting fields; if you need to make any tweaks to it, you can. That’s it! You can now move on to the other pieces of your campaign like the placement and budget. Questions? Leave them in the comments below, or check out this Facebook ad resources page to find the answers you’re looking for!